It's time to cowboy up! This is a classic western shirt. Let me ask you, what is the probably of finding ready made fringe to match the colors in this plaid? Answer please, that's right, Zero chance ...but you can make your own fringe to match! I've had some equestrian customers tell me they plan to make some extra fringe to attach to bridle headband so rider and horse will match. I recommend making the fringe for the bridle removable. We're not sure if you can reach stardom or earn extra points from the judges for horse and rider matching fringe, but you can wow the crowd and your competition as the ultimate duo~ Sweet and very Clever! Be the first on the circuit to boast matching rider and horse fringe, buy My Own Fringemaker today. Best of luck on the show circuit or along the parade route! 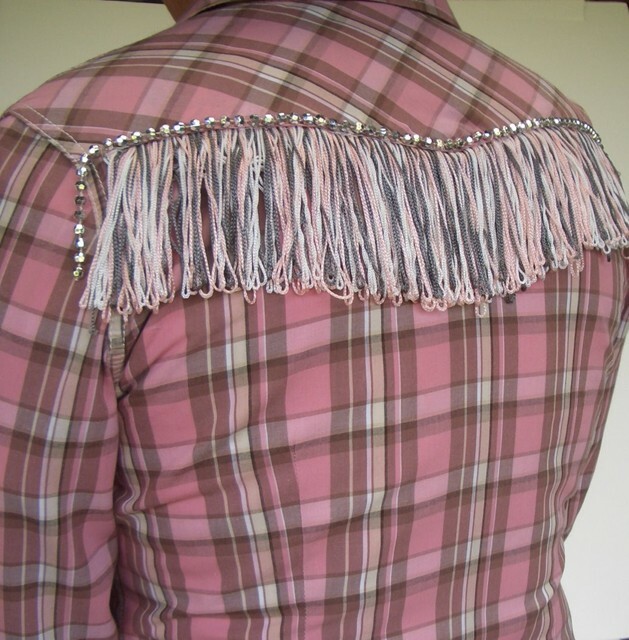 View other awesome fringe and tassels we created. Be sure to watch our informative HOW TO Make fringe videos. Learn more about our fringe maker embellishing system. We also offer yarns, ribbons and STRAND to make fringe and tassels. Reserve your system now, My Own Fringemaker, click the Add to Cart button.